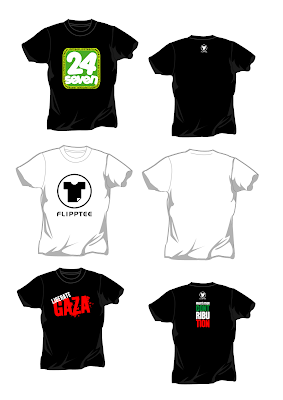 akhirnya, new designs dah pon released kat KL Dsgn Week @ Capsquare last saturday..
below is the details for each of design..
price for each dsgns is still RM25/pc..
what's so special about GAZA tshirt? bukan saja2 buat baju ni..from each shirt sold, RM2 will be donate to Tabung Aman Palestin..
so, tepuk dada tnya selera..WHATS UR CONTRIBUTION? aler how come i didn't know yr latest designs? x inform pun. tp penah dgq istilah 'ambik hati'? Lawa design2 baju hang. teruskan berkreatif! flipptee constitute of two ambitious normal men, migrating from countryside to big city as the way to boost their standard of living with their own style in addition to their normal profession...PEACE!